This extension helps the store owner in generating more traffic to website by rewarding the customers with points. Admin can create catalog advance rules for giving reward points to a particular customer, specific customer group etc. Admin can set the registration reward points which will be assigned to the customer when they register on the website. Admin can set the reward points for the customers who refers their friends to the website. Admin can assign reward points to the referrals when they register on the website. Admin can assign reward points to the customers on liking the website’s facebook page. Admin can view total number of sponsors and their combined sponsorship statistics. Admin can also view sponsorship statistics of an individual sponsors. Admin can enable or disable the approval of reward points. Admin can enable or disable the approval customer memberships. Priorities according to which reward points will be allocated to customers can also be set by admin. 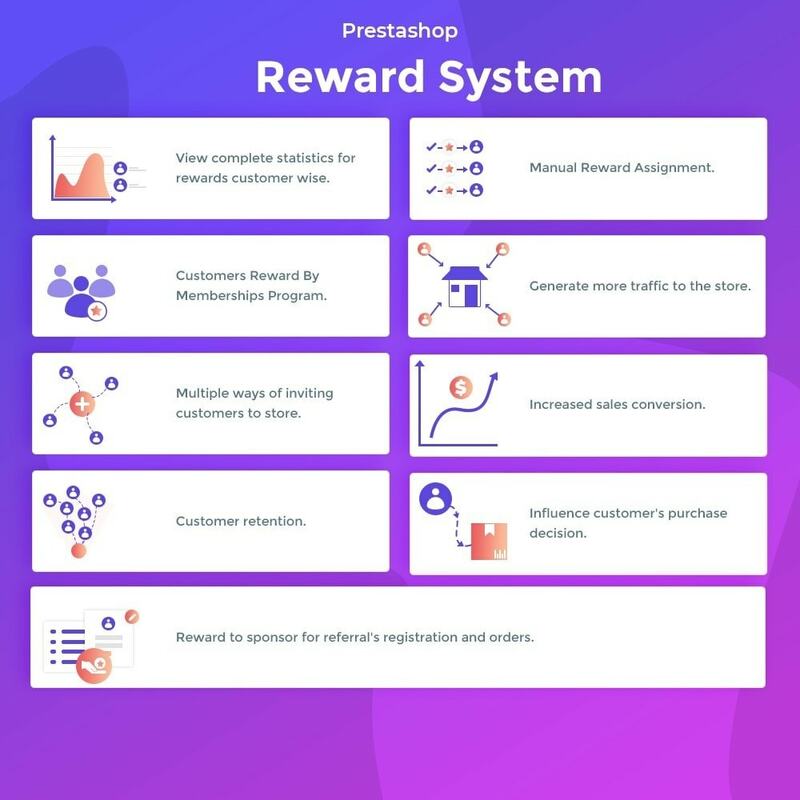 Reward points to be assigned to a customer for order, product, category, and manufacturer can be set by admin. Can enable or disable registration rewards. Can set the validity of reward points. Set minimum order total and minimum number of orders for a customer to be eligible to get sponsorship reward points. A customer can earn the reward points by referring the website to his friends. A customer gets reward points when an order is placed by friends referred by a customer. Admin can enable/disable digital marketing reward. A customer gets the reward points by liking website's facebook page as set by admin. A customer gets reward points on sharing orders of facebook if enabled by admin. Admin can configure customer's mail notifications. Admin can view reward point statistics, total reward status, reward type wise status, and customer wise status graphically. Admin can enable or disable partial use of the voucher. Admin can set criteria for customers to enter reward memberships. Admin can view total number of sponsor and their combined sponsorship stats. Admin can view total impressions to the website by sponsored users. A customer can view a list of his friends who have registered on the website and through which channel at the front end. A sponsor friend can view total referrals, assigned registration points, available registration points, order assigned points and order available points for a particular channel. #1 Prestashop Newsletter Popup Modul das ein attraktives Newsletter-Anmeldeformular auf Ihre Webseite bringt. Das Modul bietet 9+ erstaunliche und einfach anpassbare Prestashop-Newsletter-Popup Vorlagen. Das EINZIGE Modul, das 100% kompatibel mit ALLEN MailChimp-Dienstleistungen ist, dem Marktführer für Mailing-Lösungen. Automatisieren Sie vollständig Ihre Kundenbeziehung und steigern Sie Ihre Konversionsrate mit diesem sehr umfassenden Modul. Customers can earn the reward points by registering on the website. Customers get reward point by liking the website’s facebook page. Customers can earn the reward points by palcing orders on the website. Customers can earn the reward points by referring his friends to the website. Customers can earn reward points by sharing their orders on facebook. The reward points earned by a customer can be used as a discount at the time of checkout. 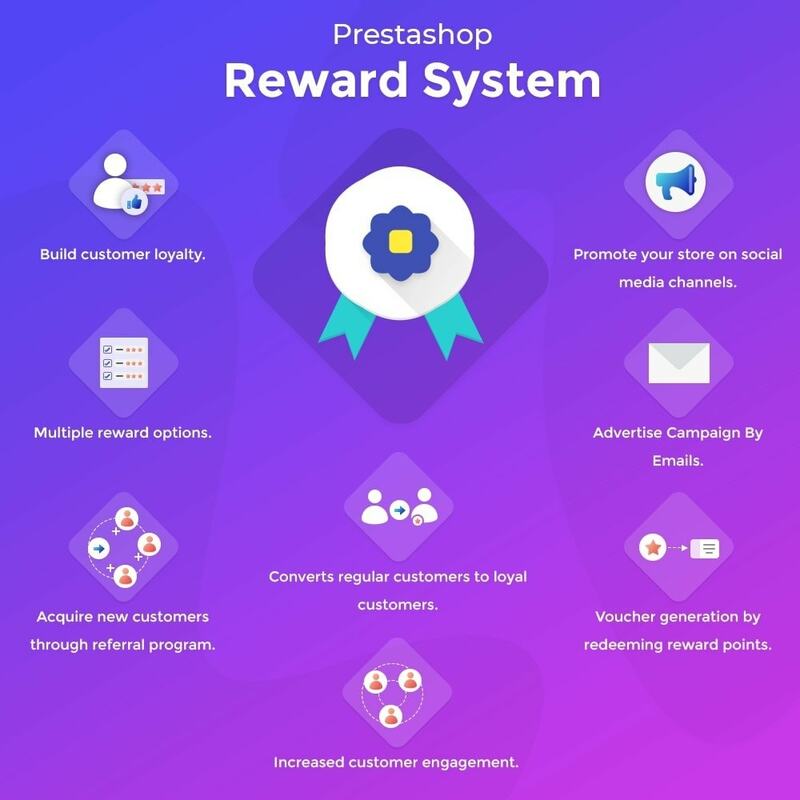 Webkul Reward System supports standard way of Prestashop Installation. For Global "minimum number of orders", Number of orders count will be calculated according to the distinct Order References (Not order id). For Global "minimum number of orders" and "minimum orders total" condition for order rewards Already created Orders will be taken into consideration while showing rewards info to the customer. Current cart will not be considered. Warning of static function at the time of module installation is removed. Resolved : On product page not reward will be shown according to the combination price. Resolved : Warnings on customer sponsorship program page on referral registration with non existing channel. Resolved : 'Home category link' on customer reward list page is redirecting on 404 page. Resolved : Customer search in advance rules is not working under sponsorship reward configuration tab. Facebook Shop like reward feature is removed because facebook has depricated there API for event when someone like faceook page from website.